For those unfamiliar, AEW is the new company started by the billionaire Khan family with Cody Rhodes, Kenny Omega and The Young Bucks serving as Executive Vice Presidents. Chris Jericho is also signed to the company and it’s rumored a TV deal is on the horizon. As you may recall … Dave last made a WWE appearance in October during SmackDown 1000’s Evolution reunion. The segment ended with a tease for a future match between Batista and Triple H. The next month, however, Triple H got injured at WWE Crown Jewel. The WWE Exec has since been cleared to train again though, as he revealed on a media call. Do you want to see The Game vs. 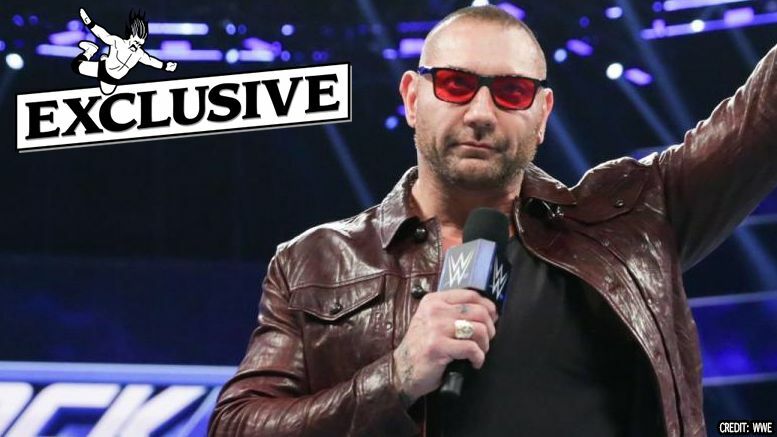 The Animal at WM35 or would you like to see Dave Bautista make an appearance at Double or Nothing? Sound off in the comments below.